A south looking view from the top. You can see the Boston skyline in the distance. 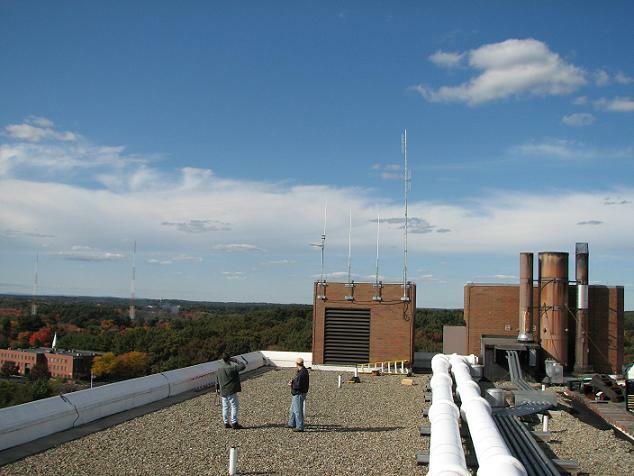 MMRA's North Reading site is atop a water tower. The two repeaters' antennas - a DB224 for two meters and an FG4405 for 440 are at the top of the water tower, as well as a corner reflector for linking. 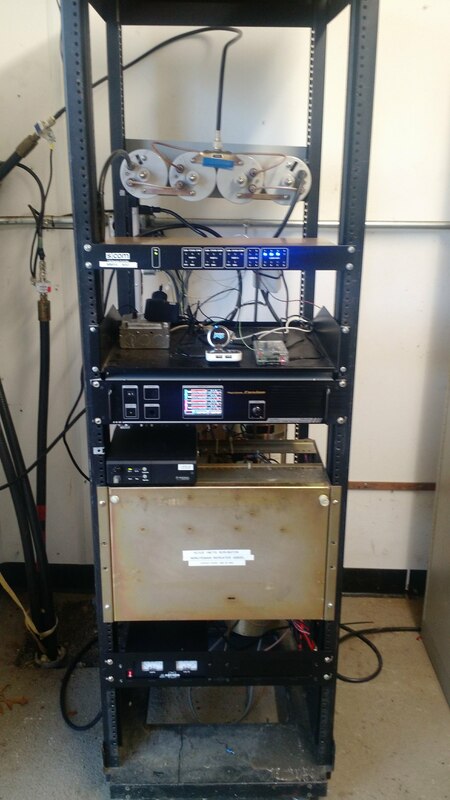 The North Reading repeater is built in a Digital Equipment Corporation computer rack. At the bottom of the rack is an Astron SRM50M power supply - which powers the RF and power amp units of the VHF repeater. Above the Astron is the Mastr II RF unit which is the VHF repeater. Next is the Motorola Radius link radio. Above this is the Yaesu System Fusion DR2X UHF repeater. On the top of this unit is the Freedom Pop modem and Raspberry Pi used for online access. The SCOM 7330 controller is at the top of the front. To the rear of the cabinet, you can see one of the cavities of the MMRA's UHF repeater. The photo to the left is of the antennas at the former Burlington site. 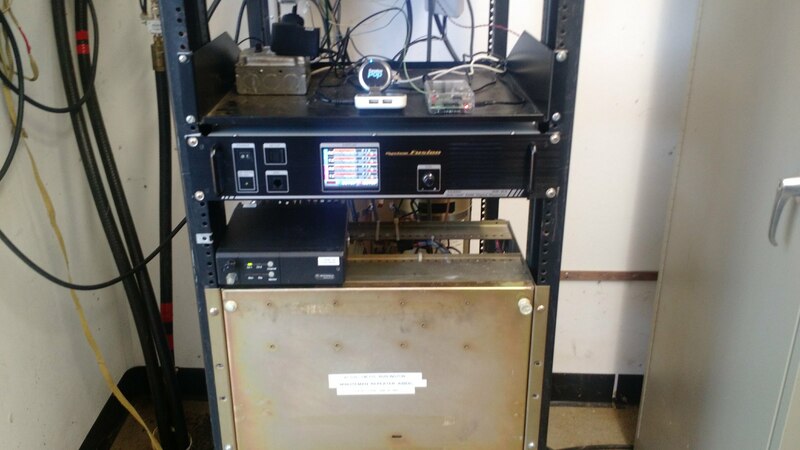 This MMRA repeater was previous located in Burlington at the Lahey Hospital. It moved to our current site in North Reading on April 30, 2016. There were five antennas. The leftmost mast holds the UHF link antenna (corner reflector) and the UHF repeater antenna (fiberglass stick). The center two antennas belong to our host's EOC (two tribanders: one is 2m/220/440 tribander, the other is 6m/2m/440). The rightmost antenna is the 2m repeater's DB224. 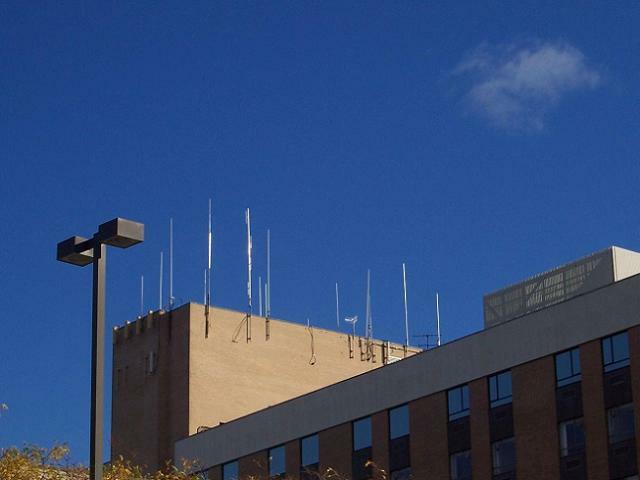 While the leftmost and rightmost antennas have been relocated to the current site, the center antennas remain in Burlington. The photo to the left is of the antennas at the former Stoneham site. This MMRA repeater was originally located in Stoneham at the New England Memorial Hospital (also known as the Stoneham hospital), in the 1970's. It remained there through multiple ownership changes and even for many years after the hospital went out of business. In Spring 2008, MMRA was notified that the hospital was to be torn down. Power is to be cut at the building in 2009. Thus began the effort to find a new site. On October 18, 2008 a crew of fifteen removed all the MMRA equipment, as well as some other ham equipment, from the Stoneham facility and reinstalled it at our new Burlington location. Downtime for the 2m repeater was less than six hours.